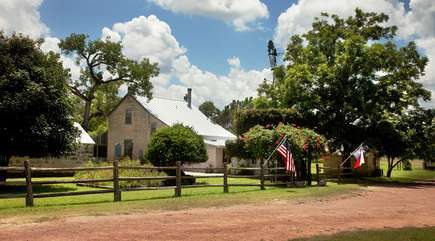 Nestled in the hills just outside Fredericksburg alongside the year round flowing Palo Alto Creek, is a wonderful pioneer farmstead. Palo Alto Creek Farm retains all of its original buildings, providing a visual timeline from when this farmstead was first settled in 1854 by German immigrant Peter Itz and his family, until the present day. The Itz House - This original farm house circa 1875 is perfect for small groups of family and friends. Downstairs offers a living room with a wood burning fireplace, comfy sitting areas and an antique farm dining table. Two handsome wardrobes are used as accents in the house. The downstairs bedroom has a queen size bed, and the bath has a tub/shower. Enjoy making those special meals in the fully equipped kitchen, which comes complete with range/oven, refrigerator, microwave, dishwasher and coffeemaker. The sleeping porch on the front of the house has a day bed. Watch the deer come in to feed or just enjoy the surrounding countryside from this wonderful porch. Upstairs is a queen-size bed with a large bathroom with a shower. Bunk beds provide additional sleeping space upstairs. The stairs are original and very steep. While staying at Palo Alto Creek Farm enjoy the abundant wildlife. Early in the morning, wild turkey have been known to meander up the creek, and there is a never ending display of bird activity and song. And, if you want a real soul-expanding experience, go outside at night and look up! The stars are incredible. Guests especially enjoy sitting under an 800 year old Live Oak to watch the deer that come in each evening. Guests are free to roam the acreage. The surrounding country roads are ideal for walking, running, hiking or biking. Maybe you saw Palo Alto in one or more of the following publications: Log Home Living featured The Log Cabin; Country Accents featured The Barn; Texas Journey featured Palo Alto Creek Farm as one of the Five Great Romantic Getaways. ; National Geographic Traveler featured The Barn; Texas Monthly featured Palo Alto Creek Farm as one of 25 favorite things that make Texas delightfully different, D Magazine and The Dallas Morning News have featured Palo Alto Creek Farm as a romantic getaway, Southern Accents pictured The Itz House, Kerrville Daily Times featured Palo Alto Creek Farm in “Remembering Romance”, Ranch & Rural Living and Hill Country Magazine both featured Palo Alto Creek Farm as a well preserved pioneer farmstead. We have been staying at Palo Alto Creek Farm since 1990. Close to town but totally out in the country. We have stayed in the Log cabin, Barn and the Itz house. Each offers a unique setting. They even have animals!! A peaceful retreat in every way. And the breakfast they leave for you is amazing. We love this place!! Absolutely amazing time! The farmhouse is beautifully done and so comfortable that we felt like we were home. We didn’t want to leave. We will definitely be back again! Absolutely wonderful! Property and extra touches from decor to snacks and coffee were first rate. Will be back, and will refer to often. Highly recommend!